Pocket Chainsaw - Part of Your Emergency Survival Gear? 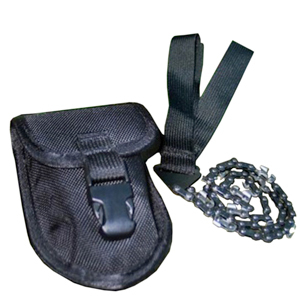 Why Should the Pocket Chainsaw be Part of Your Emergency Survival Gear? What should be part of your emergency survival gear? This is something that many people advise you about; not to forget, the many recommendations by different websites. To begin with, as its name suggests, the pocket chainsaw is designed to neatly fit into your backpack, jacket or even your trouser pocket. Compact and packaged within a small pouch, this chainsaw’s compact size is a major reason to consider it as part of your survival gear. Easy to carry around, it can neatly slide into your kit or backpack and its light-weight ensures that hardly any extra weight is added to your backpack or kit. Light-weight and portability are not its only significant features. Flexible links with easy to use strap handles is another of its major advantage factors. The saw is approximately 24 inches; however, the flexible linking ensures it can be tidily folded up and slid into its pouch consuming hardly any space in your survival kit. Moreover, the flexible linking ensures that space, or the lack of it, are no inhibitors in its usage. The saw can easily and quickly slide through even the smallest gaps and be used to pull down or clear out branches. Flexible saw means enhanced manoeuvrability. What more can you ask for in the wilderness? Don’t underestimate the capacity of this human-powered saw by looking at its flexible nature or compact size. This chainsaw is capable of cutting through most tree branches, thanks to its cutting teeth design. The product has been enhanced to include teeth for every link. In other words, you can chew through wood faster and more efficiently. No more spending hours to collect some firewood for your camp fire or wasting time walking round-about during your trekking and hiking trips. Clear your pathways and get all the firewood you need easily and quickly with this compact piece of sawing equipment. So, that just makes it an ideal choice for your trekking and camping backpack. But, why should this tool be part of your emergency survival gear? Well, for one, this chainsaw is human powered. Dependency on fuel or other power-supported devices is one thing that makes devices useless during emergencies. You don’t have to worry about carrying extra fuel or keeping your saw ready and charged all the time. After all, emergencies never come with a warning! All that you need to do, with this pocket chainsaw, is to pull it out of your pocket and get working! One quality that most people look forward to in any emergency equipment is its weight, or to be more precise, the lack of it. During emergencies the focus is on survival; therefore, food, water, clothing, and shelter equipment take priority. However, some basic tools and equipments are also part of survival kits. What tools we select to go into this kit would depend on its portability, flexibility, and ease of use factors. Not to forget that tools that offer multiple benefits always find a higher place in the essential equipments list. And this is where your pocket chainsaw could easily find its place in the list. While going on a road trip, when hiking or trekking, when camping, during holiday trips or just at any time during travel or at home; the pocket chainsaw can be used anytime, anywhere and anyplace. It can be used in different scenarios and for different purposes. Whether you want to clear the overgrown trees in your garden, to clear the pathways while trekking, to collect firewood during camping or even to help you out during disaster situations – the pocket chainsaw could easily be your go to companion. What’s more, you can have your pocket chainsaw delivered at your doorstep. Stunning Gadgets offers a pocket chainsaw, besides other interesting products, that could very well become part of your emergency survival kit. Weighing around 4 ounces and neatly packaged in a convenient pouch, the chainsaw is made of steel and available in black colour. The product also comes with a lifetime guarantee that ensures your investment is worthwhile. What you see is what you get; there are no hidden clauses or sale gimmicks. The pocket chainsaw is considered an ideal choice for all those looking to create their own survival kit. It is also good as a prepping tool. Flexibility is not only in its design but also in its usage. The strap handle ensures you can increase the length of your saw by looping through extra cordage. You can now reach the higher branches in a tree without having to clamber up all the way to cut it down. You don’t need a ladder, just some extra length of cordage. It couldn’t get easier than that. 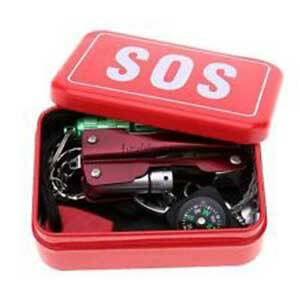 This is a piece of emergency survival gear that you can teach even your children to use. Light in weight and flexible, this could easily be your child’s first sawing tool. Learning to saw with this pocket equipment could be a fun activity that you can share with your kids. Fun time and learning time could be combined for a great activity time. Being a simple piece of equipment, it is also safe to handle for children as long as you supervise their activities. You just need to ensure that basic safety measures are in place, as with usage of all other tools and devices. Check out the ratings and reviews of the many satisfied users; it will add another reason to get your own pocket chainsaw. A simple and efficient tool that can be an integral part of your survival kit; this tool is a worthy investment. Do you need more reasons to make it one of the elements in your emergency survival gear?